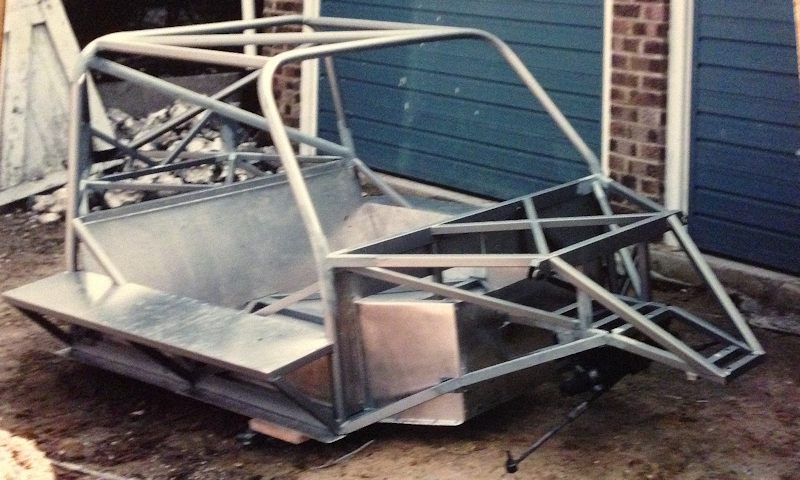 Attached are a few pictures of my Rawlson Spaceframe chassis #1 Imp, built by myself and Barry Sheppard of Rawlson in Dover in 1977-78. The car was powered by one of Clive Brown's demon 850cc short stroke engines and we won many races and set several lap records at tracks throughout England. 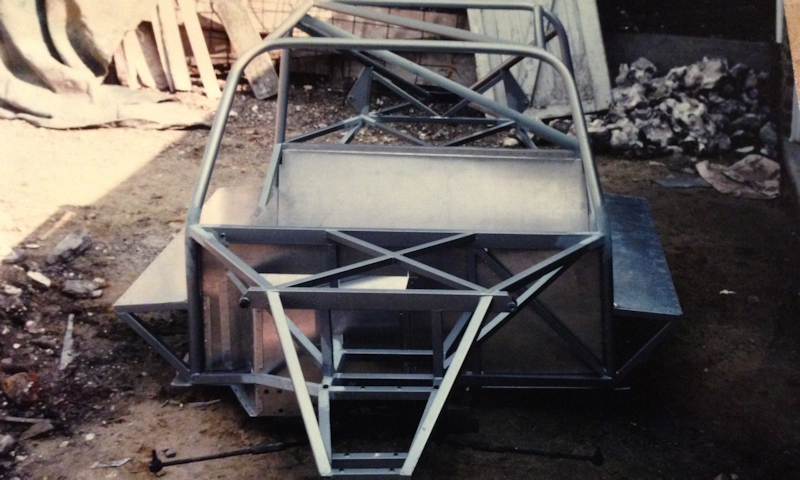 Barry sold other spaceframe units to Jim McGaughay and Chris Roberts. The car was outwardly very similar to John Homewoods 1,000 cc car. 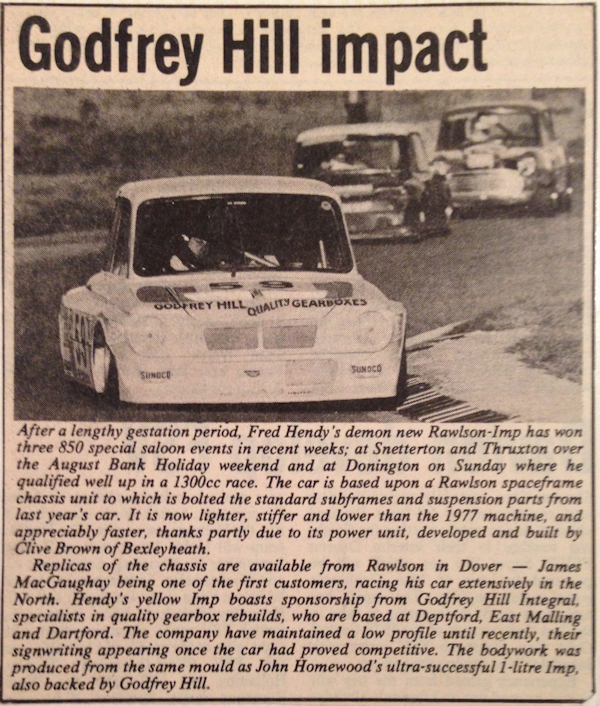 John was a good friend and his sponsor Godfrey Hill gearboxes decided they would also sponsor me in the 850cc class. The main difference was that John's car was a on a monocoque Davrian unit and mine was a Rawlson spaceframe with a one-piece Davrian shell. The car was quite heavy, compared to some of the other spaceframed units, but it was a very rigid platform and proved to be very competitive. 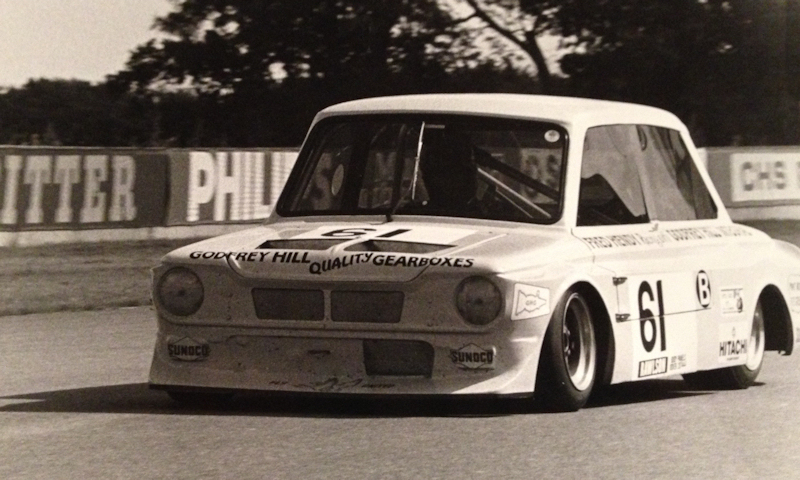 The black and white clipping is from Autosport and taken at Snetterton - I'm guessing around June 1978. The black and white photo of the car racing on its own was taken at Donington Park in 1978. After a lengthy gestation period, Fred Hendy's demon new Rawlson-Imp has won 3 850 special saloon events in recent weeks; at Snetterton and Thryxton over the August bank holiday-weekend and at Donnington on Sunday, where he qualified well up in a 1300cc race. The car is based upon a Rawlson spaceframe chassis unit to which is bolted the standard subframes and suspension parts from last year's car. It is now lighter, stiffer and lower than the 1977 machine, and appreciably faster, thanks partly due to its power unit, developed and built by Clive Brown of Bexleyheath. Replicas of the chassis are available from Rawlson in Dover - James MacGaughay being one of the first customers, racing his car extensively in the north. 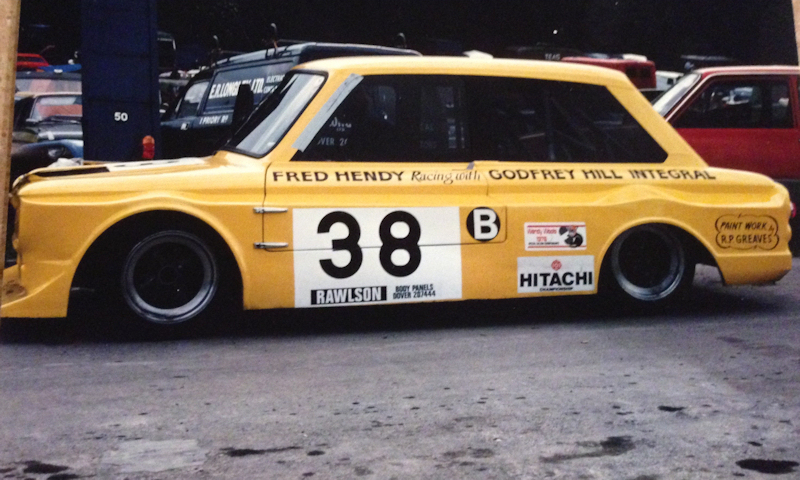 Hendy's yellow Imp boasts sponsorship from Godfrey Hill Integral, specialists in quality gearbox rebuilds, who are based at Deptford, East Malling and Dartford. The company have maintained a low profile until recently, their signwriting appearing once the car had proved competitive. The bodywork was produced from the same mould as John Homewood's ultra-successful 1-litre Imp, also backed by Godfrey Hill. As you might remember from Imp National 2014, I have a Rawlson Davrian spaceframe Imp, and I have been in touch with Fred Hendy quite a lot recently while trying to sort out it's history. He has sent me a load of photos, and also asked if I could forward copies on to you.....he has lost your e-mail address. There are about 10 photos, and about 1MB each. How many can your inbox cope with at a time / per e-mail ? This is bottom bend at Brands hatch Michael Holland leading from Chris Roberts and myself, Michael Holland blew up in front of me at Paddock , I was right on his tail and he put a rod through the side , it was like someone throwing a bucket of oil over my windscreen, I saw an ominous red glow in his exhaust before his engine blew, I won the race Chris was second. These were great times the racing was fiercely competitive, some of the best days of my life. 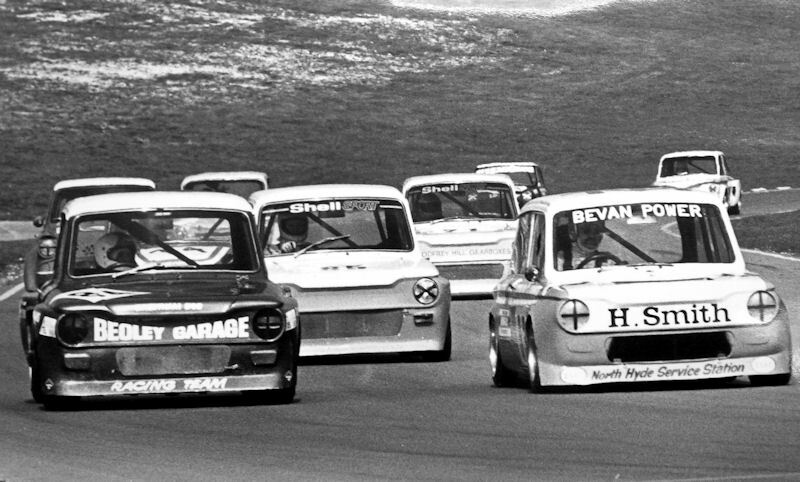 This picture is from Snetterton Hitachi Championship 1978 me leading Chris Roberts ( in his new car) and Charles Bernstein in his Mini. 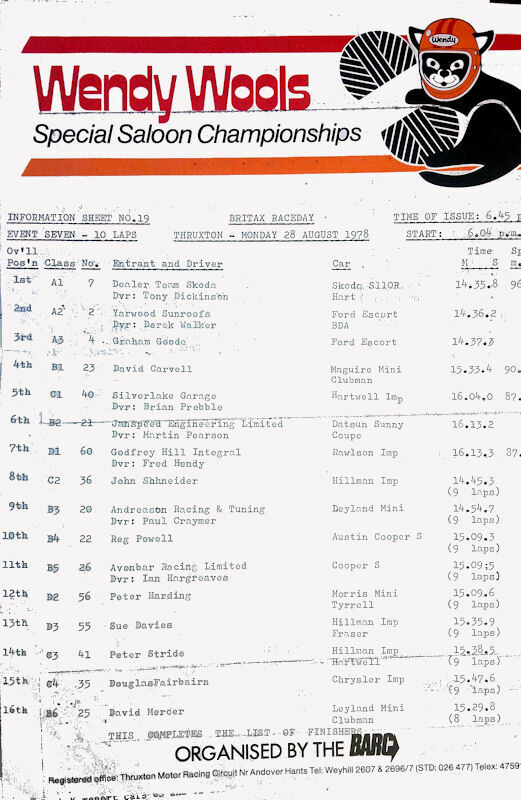 Fastest laps from Thruxton, I equaled the lap record, which was held by Reg Ward. This one is from Donnington Park. I won the class, Chris set fastest lap but crashed.